If you’re keen-eyed, you may spot the remains of a sticker on the front of this record’s sleeve. I tried my best to remove it, I really did, but it was stuck on with some kind of industrial-strength super-super-glue, and what you see that’s left is a pretty good outcome, I can tell you. If you’re very keen-eyed, you may recognise the sticker as the type put on when a record is put up for sale at a branch of the Record & Tape Exchange in London. Criticisms about their choice of sticker aside – why would they choose a type that a geekoid record collector couldn’t easily remove? – I love those shops. I’m not sure how many of them there are, but I’ve been most often to the main branch in Notting Hill, which has an Aladdin’s Cave-type basement that’s absolutely packed with racks and racks of records for sale. The joyous thing is that they price their records very cheaply, and they always seem to have a surfeit of impossibly obscure indie records amongst the racks. I can’t remember how much this record cost me exactly, but I’d be pretty confident in stating that it won’t have been more than twenty pence. ‘Word of warning,’ as that chap off of The Office would say; if you’re going in there for a ‘quick browse’, be totally prepared to emerge, bleary-eyed, hours later, with armfuls of records by bands that you’ve never heard of. I’ve mentioned Gag on another post here before, so I won’t bang on about their extraordinary excellence again. God Is My Co-Pilot, though, or Godco (as they’re referred to on this record), I haven’t. I like them; they are crazy, and noisy, and nonsensical, and have wacky distorted guitars and a chaotic type of energy. I’m sure I have a tape somewhere that features John Zorn squonking his saxophone atonally over a selection of their songs – I should dig that out. 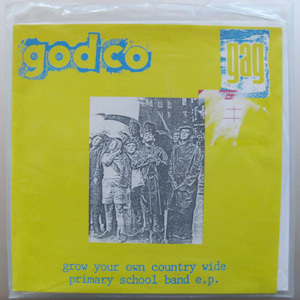 Godco/Gog Is My Co-Pilot are one of those bands with around twelve thousand separate releases under their collective belt. I like it when bands that are completely unknown to even the more experimental ends of ‘the mainstream’ are, at the same time, extraordinarily prolific and popular in some weird underbelly of music appreciation. 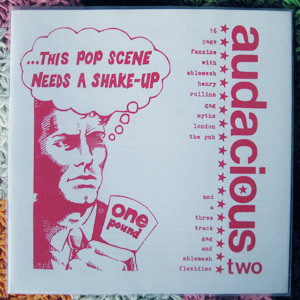 Admittedly, I did pick this record up for less than twenty pence after – I presume – somebody else had decided they didn’t want/like it, but more fool them. I’m not going to sell it on. One final word about the Record & Tape Exchange. This, and other records I’ve bought from there, came with the original (and correct) inserts intact – lyrics and ‘thank-you’s from the bands, and a label release round-up. I like that. I’m not sure why. To me, they form part of the package and the record would be a lesser thing without them.